Cook spinach on stove top as directed on package. Drain excess water from spinach, set aside. Combine sour cream, mayo, soup mix, salt, and onions. Mix until well combined. Fold in spinach and add lemon juice. Stir well. Refrigerate 4 to 6 hours. 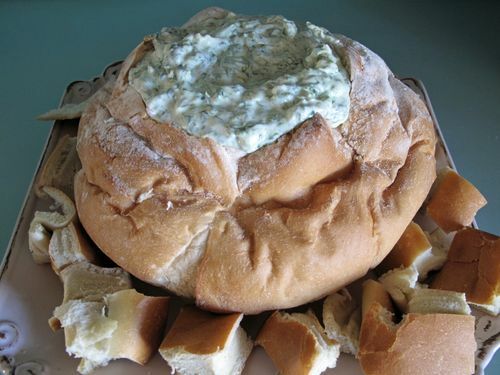 Serve in bread bowl and use bread for dipping. Mix graham cracker crumbs, 1/4 cups sugar and butter. Press in 9 x 13 pan, refrigerate 15 minutes. Beat cream cheese, 1/4 cup sugar and 2 TB milk until smooth. Gently fold in 1/2 of Cool Whip. Spread over crust. Combine pudding and milk, beat until smooth about 2 minutes. Pour over cream cheese layer. Refrigerate 4 hours or overnight. 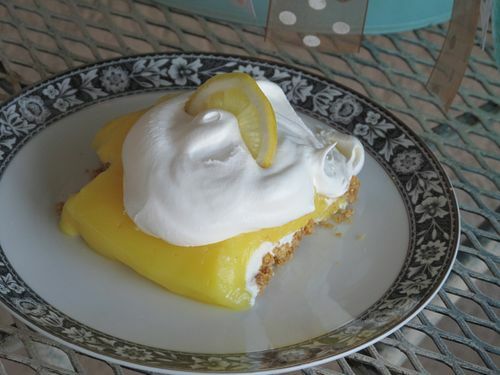 Add dollop of Cool Whip and lemon wedge for garnish. Mix juices together until well blended. 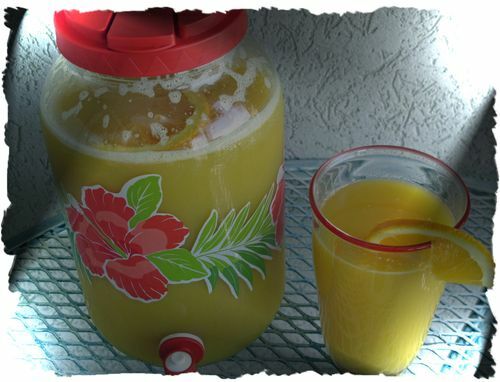 Add ginger ale and garnish with orange slices. Combine butter and sugars until smooth. Add eggs, vanilla and peanut butter. In separate bowl, combine flour, soda and salt. Add to sugar mixture slowly, alternating with milk. Mix well. Fold in kisses. Drop a generous amount of dough on parchment covered cookie sheet. The photo doesn't show it, but these cookies are HUGE! Bake 375 degrees for 18 minutes, no longer. 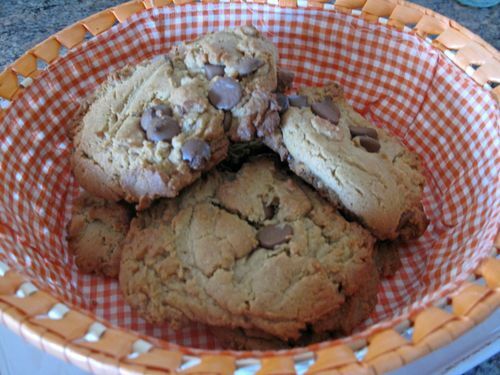 Cookie will be a dark golden brown--a crunchy yummy cookie. Serve with a glass of milk............delicious! Sprinkle marshmallows in 9 x 13 greased pan. Set aside. In bowl combine sliced strawberries with 1/4 cup sugar to sweeten (skip sugar if using sweetened frozen berries). Let sit for 15 minutes. Sprinkle with gelatin and stir, set aside. In mixer add shortening, sugar and eggs one at a time. Add vanilla. Combine flour, baking powder and salt. Add dry ingredients to cream mixture alternating with milk until well combined. Pour batter over marshmallows. Spoon strawberry mixture evenly over batter. Bake 350 degrees for 40-45 minutes or until toothpick inserted in center comes out clean. Cool on wire rack. 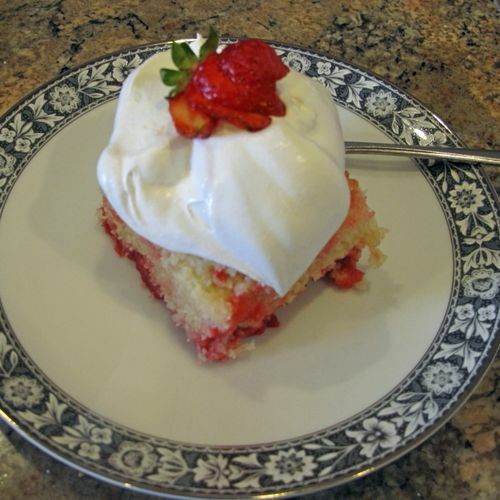 Cut in squares and garnish with strawberries and cream.